Dave Whitlock, is a native Oklahoman who, thirty-five years ago resigned his position as a research chemist and pooled his talents in painting, illustrating, writing, photography, flyfishing and lecturing to embark on a new career as a full time professional in the arts of flyfishing. All his works, especially his art, reflect the realism of nature and related fly fishing subjects through the eyes of the sportsman. His diversity has always taken him into new and creative directions including, in recent years, trout stream design and restoration, with Johnny Morris's beautiful Dogwood Canyon being a great example. Dave Whitlock has been creating fly fishing fine art paintings and illustrating his books and articles for most of his life. Listen in to find out how Dave got started, how he creates and how he sells his artwork. Dave regularly contributes his flyfishing art, photography and writing to many publications such as FLYFISHERMAN MAGAZINE, FLY FISHING & TYING JOURNAL, TROUT MAGAZINE, IN-FISHERMAN and FIELD AND STREAM. 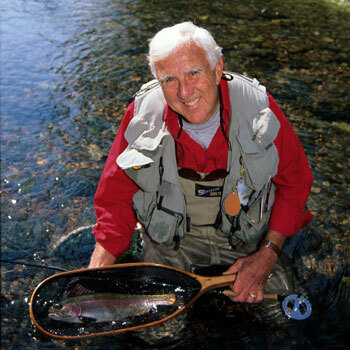 He has written and illustrated four books: DAVE WHITLOCK'S GUIDE TO AQUATIC TROUT FOODS, the L.L. BEAN FLYFISHING HANDBOOK, the L.L. BEAN BASS FLY FISHING HANDBOOK and IMITATING AND FISHING NATURAL FISH FOODS for Lefty's Little Library. Dave has also co-authored or made contributions to many other books, including THE FLYTYER'S ALMANAC, SECOND FLYTYER'S ALMANAC, Art Flick's MASTER FLYTYING GUIDE, McClane's FISHING ENCYCLOPEDIA, Migel's STREAM CONSERVATION BOOK and MASTERS ON THE NYMPH and others. He has illustrated over 20 books including Steve Raymond's YEAR OF THE ANGLER and YEAR OF THE TROUT, Swisher and Richard's new edition of SELECTIVE TROUT, plus President Carter's OUTDOOR JOURNAL. Dave also demonstrates his flyfishing and teaching skills in seven videos and through guest appearances on televised flyfishing programs. One of Dave's most notable contributions to wild trout management and preservation is the Whitlock-Vibert Box System -- a unique and efficient, instream salmonoid egg incubator and nursery devise. Dave spent 7 years researching and developing this system and wrote and illustrated an instructional text, the FFF WHITLOCK-VIBERT BOX HANDBOOK. Today, under the sponsorship of the Federation of Fly Fishers, this Whitlock-Vibert Box program is used throughout the world for introduction or enhancement of wild trout, char and salmon stocks. Dave's experience and his devoted and objective outlook on the whole spectrum of flyfishing has earned him consulting assignments from top companies such as 3M Scientific Anglers Company, Bass Pro, Sage Rods and Simms Fly Fishing Gear. He designed and directed the first 10 years of the LL Bean Flyfishing Schools. Dave is in demand as a lecturer on flyfishing and conservation throughout the world and has produced many slideshows on the subject plus one movie. Dave also conducts flyfishing courses yearly throughout the U.S. and abroad. Dave is a recipient of many awards including the Max Ander's Wild Trout Award in 1976 for his work on propagation of wild trout and the FFF's Conservation Man of the Year Award in 1981. Dave also received the Buz Buzeck Flytyer's Award which is the highest honor in the fly tying world. It recognized his innovativeness in new flytying patterns and his national flytying activities. In 1987 Dave was inducted into the National Fresh Water Fishing Hall of Fame and was presented the FFF James E. Henshall Award for his work in warm water fishing and conservation. He also received FFF's Ambassador Award for national and international promotion of flyfishing and conservation. In 1996 Dave was inducted into the Arkansas Game& Fish Hall of Fame and the next year was given the Lifetime Contribution Award from the National American Fly Tackle Trade Association. Dave and his wife Emily, after living near the White River in Arkansas and conducting their flyfishing school there for several years, have just recently moved back to Oklahoma, in the Ozark Mountains near Tahlequah. There they continue to teach privately and pursue their writing, art and stream work projects. Dave Whitlock is a man totally devoted to the world of flyfishing and conservation both professionally and personally. For more information on Dave's book, art, writing and instruction go to his web-site www.DaveWhitlock.com.